One of my friends from the international student's organization over here, who is also Danish, promised her roommates to cook them up a proper Danish meal. She asked me to join and help me cook the meal. 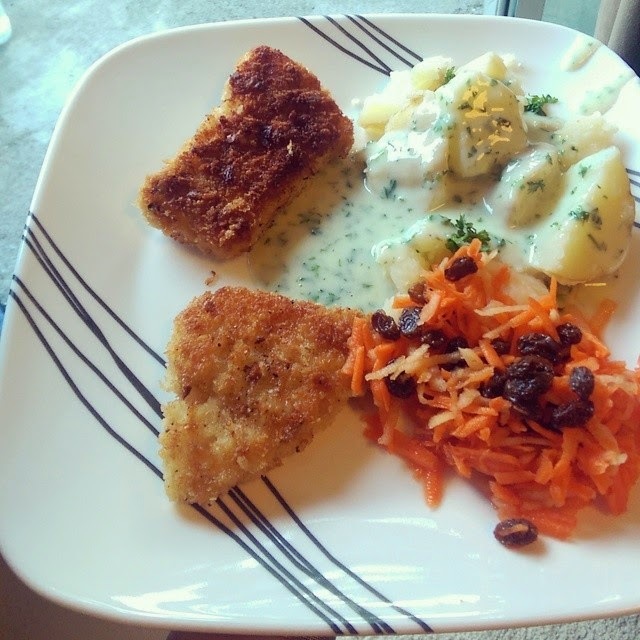 We ended up making fried fish("stegt fiskefilet") with a parsley sauce, potatoes and a carrot salad. I hope you enjoy! Filet of fish. We used some cod and some common sole. In Denmark we commonly use European plaice. I think we used about 400lbs of fish per person, but there was some left. We cut each filet in two or three pieces. Flour - Just some standard, nothing fancy, all-purpose. Not something with raising agents in it ;) You only need a handful or two. Eggs - We used two eggs for 1600lbs of fish. Breadcrumbs - Use what kind you like. We used panko, which is one of my favourites, and while it's not all typical, it's very nice and a little less greasy. We changed the flour for sweetened rice flour. You can use gluten-free flour, but Safeway didn't carry that. Fine maize-flour will also work. The breadcrumbs were changed for corn flakes. They were crushed up, so the size of it were like the panko/breadcrumbing. If the fish is a bit "wet", pat it dry with a piece of paper towel. Put flour, eggs and breadcrumbs in each their bowl, and get a plate ready. Whisk the eggs. Add salt and pepper to the breadcrumbs/panko/cornflakes. One by one, turn the fish in the flour, till they are thoroughly covered with a light dusting. Transfer the fish to the egg mix, make sure not to get too much one, just so that they are lightly covered. Then transfer the fish to the plate with the breadcrumbs etc, and make sure it's covered, before letting it rest on the plate. At this point, you can decide to finish all of the fish before cooking or cooking as you go. Heat a skillet on medium heat and use a GOOOD amount of butter or oil. I'd always chose to use only real butter, but my friend preferred to cook in oil. They need to fry a bit. Don't touch them for the first 5-7 minutes. Ideally you only want to turn them over once, after 5-7 minutes or when properly browned, to make sure they don't lose their breading. When done on both sides, transfer to a plate covered with a paper towel. Parsley. We used a bundle, maybe two or three handfuls. To me, the more, the better. I was actually surprised how well the sweetened rice flour worked for our sauce. We substituted the flour for this. In regards to milk - Whatever rocks your boat. I'd normally have used soy milk and cream instead of milk and cream, but since she was allergic to soy, that wasn't an option. I'd probably go for rice milk. Make sure it is unsweetened. This sauce is made with a roux. Start out by chopping the parsley finely. Then melt the butter in a skillet with a thick bottom. Add the flour and keep whisking on light/medium heat, until it is "baked" and the flour-y taste is gone. Turn up the heat a bit, to medium and add milk little by little, and keep whisking. You'll see that it becomes a thick, thick paste. Just keep whisking and add a little more milk, it'll be fine eventually. Add the cream at the end, keep whisking. Add the parsley and taste the sauce with lemon and pepper. Let it boil through for a couple of minutes, while whisking. Finish tasting with salt. Boil potatoes with salt. I like them over-boiled, so I boil them way too long. Add a bit of melted butter and some chopped parsley. Grate carrots and apples. Add raisins and seeds. Add the juices as a dressing, don't use too much. This can be done in the beginning, so that the salad has time to set. Thank you for sharing the recipes!